This Name Bracelet has a simple, elegant design. It features Sterling Silver, as well as your choice of Swarovski Crystals whether it is your child birthstone or any color I have here. 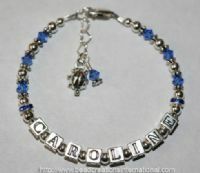 The bracelet is personalized with your childs name. This bracelet will certainly be noticed, so be prepared to receive a lot of compliments on it. 2 Rondelles on each side of the name included. This price is w/ up to 6 letters, additional letters will be $2.50 each. Dangle and Charm are not included in this price but can be added below.